Love your place…renew your space!! If you are living on campus now, in any of our 25 Residence Halls, 3 White Creek Apartments Buildings, 10 Gardens Apartments Buildings, or 12 Corps of Cadets Halls, you will go through Contract Renewal 2019 to tell us what you want to do for on-campus housing for next year (Fall 2019 –Spring 2020). 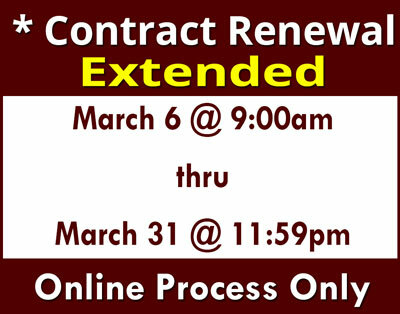 Contract Renewal is your opportunity to renew your contract or to request to move to one of our other on-campus properties for next year. Returning students who request to stay on-campus for upcoming academic year will be guaranteed a space on-campus. Students who miss Contract Renewal may not be offered the same guarantee to stay on campus for next year. Contract Renewal for Residence Halls, White Creek Apartments, and Corps of Cadets has been extended. Wednesday March 6 thru Sunday, March 31, 2019. Change: Geoscience LLC will be moving to Wells Hall. Wells 2nd floor will be coed by room. Find out more about the Contract Renewal process on our How-To’s and Procedures page under the Contract Renewal toggle. Ready to complete Contract Renewal or extend your apartment lease? Click the GET STARTED button below.